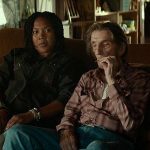 Joyce Glasser reviews Lucky (September 14, 2018) Cert. 15, 88 min. 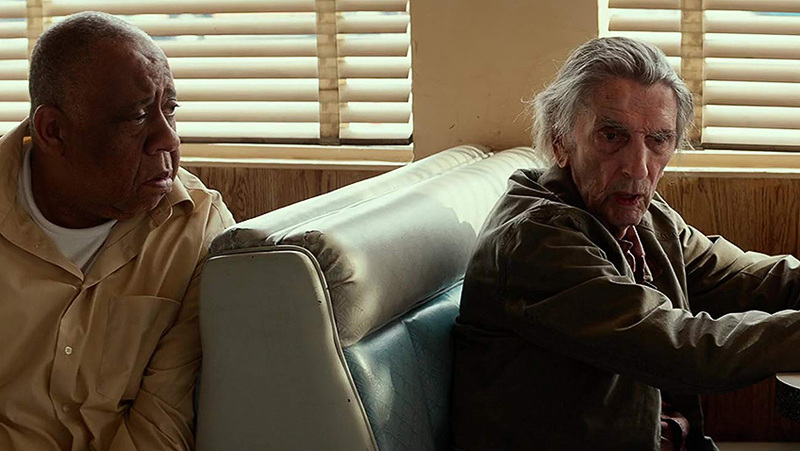 Lucky is a tribute and love letter from writers Logan Sparks and Drago Sumonja and from character actor (Gran Torino, Shutter Island) turned-director John Carroll Lynch to the 89-year-old Kentucky born actor Harry Dean Stanton (Paris, Texas). Stanton died, age 91, a few days before the film’s US release. Lucky is also a meditation on ageing, loss and mortality that feels, at times, eerily real. Biographical references appear in the script (many are inside jokes) and in the casting. The famous director David Lynch almost steals the show as a businessman mourning the disappearance of his old tortoise and Lynch directed Stanton in three of his films: The Straight Story, Wild at Heart and Twin Peaks (and reprised his role in the 2017 TV revival). 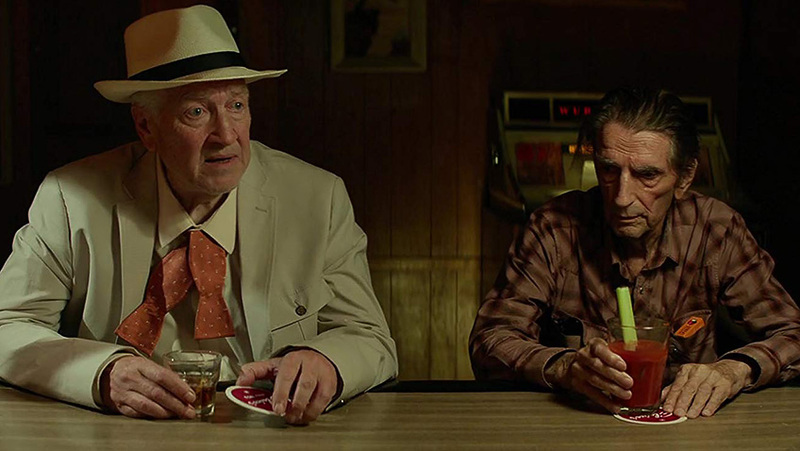 The actors, many of whom are over 60, all have connections to Stanton and/or John Carroll Lynch, who makes his directorial debut at 65 with Lucky . A painfully thin, leather-skinned man of around 90, Lucky lives alone in a Spartan bungalow at the edge of an undistinguished desert town. Even the location harks back to Stanton’s great starring role in Wim Wenders’ 1984 road movie, Paris, Texas. From the moment we see Lucky, we are aware that this town is, literally and figuratively, the end of the road. An unmarried atheist who has no children and likes his independence, Lucky turns out to be a needy, lonely man despite knowing everyone in town. His painful routine, which he clings like a lifeline, consists of a bit of yoga with his cigarettes and coffee (heavy on the cream and sugar) for breakfast and then a walk to the shop; television game shows in the afternoon with more cigarettes and coffee, and, at night, a few drinks at Elaine’s, the town’s bar. Still Lucky is shaken. He has always been of the view that nothing lies beyond the here and now, but he is not quite prepared to go quietly or otherwise into that good night. 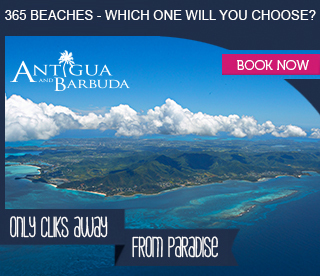 Lucky is known and loved – or humoured – by the towns’ folk who seem to understand him more than he understands himself. One such person is Loretta (Yvonne Huff), the waitress of the coffee shop where Lucky is a fixture, although he is hardly a big tipper. One afternoon after the health-scare, Loretta checks up on Lucky and seems reluctant to leave despite his less than hospitable reaction. Gradually, he opens up to her – in his way – by inviting her to sit down to watch a Liberace concert (a first for Loretta) while smoking marijuana. Musing on Liberace’s sexuality, he abruptly tells Loretta, ‘I can’t even get it up anymore,’ which comment prompts Loretta to prepare to leave. But not before Lucky blurts out: ‘I’m scared’. While this scene has a key function in the narrative and Lynch downplays its inherent sentimentality, the scene fails to evoke tears or pity. In order to introduce us to the characters in the town the filmmakers follow Lucky along his route. And what a sublime group of characters happen to live in this non-descript American landscape where it never rains. 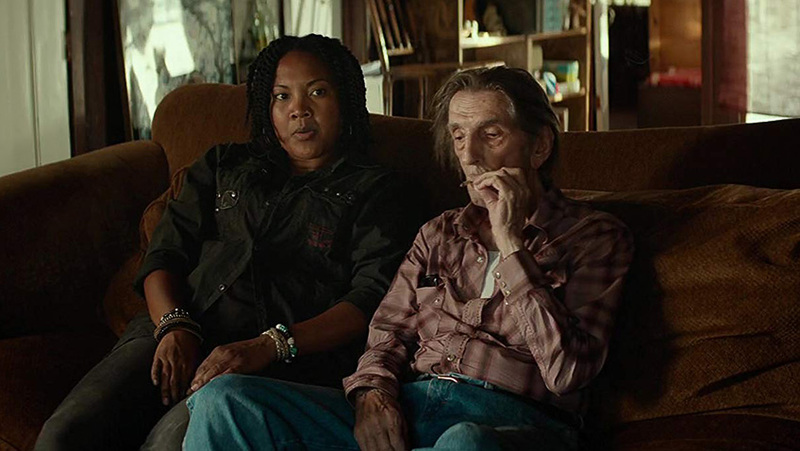 It’s like a reunion of actors whose names you haven’t heard in far too long, but whose talent is undeniable when you see their generous supporting roles in Lucky . Ron Livingston (recently seen in Tully) is terrific as a life insurance salesman attacked by Lucky for turning death into a business transaction, until Lucky seems to realise that he has misjudged the man. Tom Skerritt, 84, (who co-starred in Alien and M.A.S.H. and won an Oscar for Turning Point) is equally mesmerising and moving as Fred, the ruggedly handsome Pacific war veteran. He is a stranger in town and the only man Lucky approaches and feels close to, although their bonding over the war is more like a trip down memory lane and unfinished business. This is where we learn that Lucky, too, served in the Pacific war, but ‘never got off the boat’ to see combat action. The biggest surprise, perhaps, is 82-year-old James Darren (remember him from Gidget and Goodbye Cruel World?). He is captivating as a charismatic loser who has found a raison d’être in the arms of the fun-loving, but feisty and no-nonsense bar owner, Elaine (Beth Grant, No Country for Old Men, Little Miss Sunshine, Rain Man, Flatliners and TV’s The Mindy Project). Writers Sparks and Sumonja want us to join the locals in reaching out to Lucky, but, he does not come across as a likeable person. It is not only the self-obsessed nature of his interaction with others – which, we suspect, is only partly related to his fear of death. His stand-off with Elaine over the no smoking sign in her bar reveals him to be a stubborn and selfish man who fails to see how his right to smoke might infringe on the rights of others to enjoy an enclosed smoke-free space. Lucky does not know the name of the only son of the Mexican convenience store proprietor (Bertila Damas) although Juan’s photo is at the till. Her shop is one of the stops on his daily routine, so you would think he would know the boy by now. Nonetheless, when he shows up – without a gift – at the chubby, buck-toothed kid’s birthday party, Lucky diverts the attention from Juan when he bursts out with an admittedly impressive version of Red River Valley – accompanied by the party’s mariachi band. As Lucky basks in the applause he feels appreciated and part of the community. But this is Juan’s birthday and upstaging a kid who is hardly Mr Popular at school is not the act of a confident or thoughtful man. But Stanton’s performance, if quirky, is nuanced and expressive, and director John Carroll Lynch’s savvy casting is reason enough to see the film. And even to see it twice.